The difficult bit about the log at this time of year, apart from finding the time to sit in front of the computer, is what to leave out. There are so many bulbs in their full glory and they all deserve some space on the log but it would take forever and it would be some size of log. 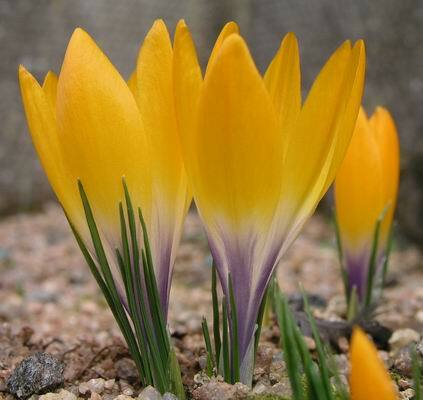 So I have to choose and I will include the last two Crocus of the season, especially for Tony Goode who has shared many of his superb pictures of his crocus collection with us through the forum. What a wonderful colour this snow melt species has. I am very glad that it seems to be satisfied with the cool growing conditions that Aberdeen offers it. 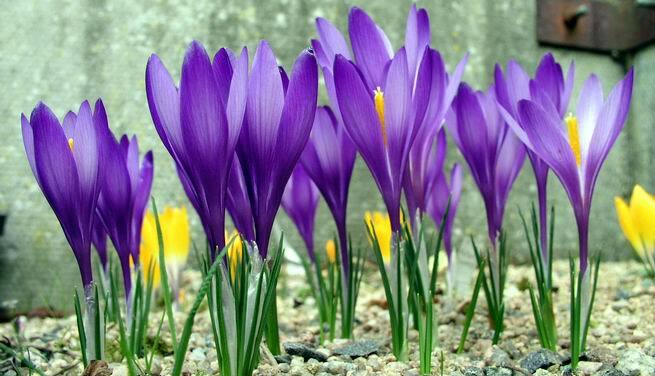 In the background you can just make out the closely related Crocus scardicus. 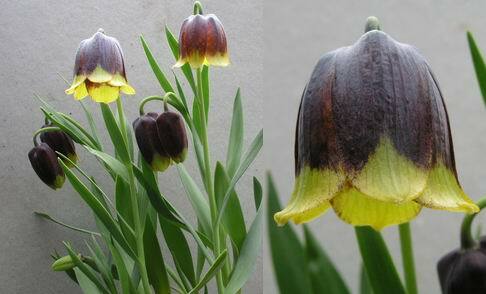 You might have guessed that Fritillarias would feature heavily in April. We took a display of Frits to the Stirling Show last Saturday to let the public see just how wonderful and variable they can be. 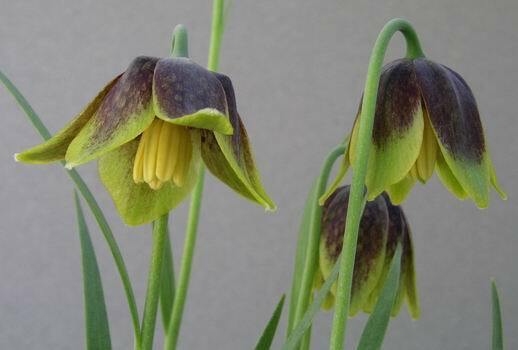 Fritillaria 'Craigton Max' is our own selection from a batch of Fritillaria kotschyana seedlings. 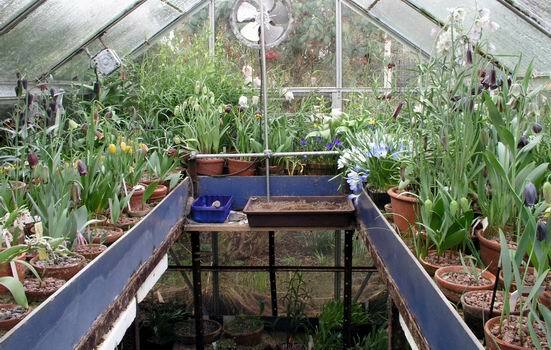 At about three years old one seedling bulb was more vigorous than the others, it was not only bigger but it was also producing small bulbils freely, so we separated it out and grew it on as a clone. When it flowered it had very large greenish flowers quite different from its sister seedlings which all had smaller brown flowers. 'Craigton Max' is in the centre with two other seedlings at either side so you can compare them. I was delighted when Fred Hunt put it up to the Joint Rock Plant Committee at the Edinburgh Show and it was awarded a P.C. This is what makes growing bulbs from seed so exciting when you raise a great form like this that will multiply well as a clone and get spread around other growers. 'Craigton Max' is fertile and we are growing on seedlings - it will be very interesting to see, in a few years time, what they look like. 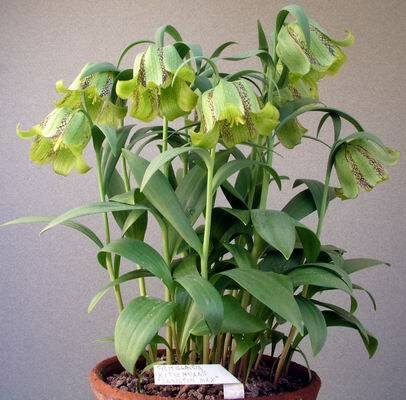 It is not so many years ago that Frit michailovskyii was quite an expensive bulb, now it is appearing by the packet full in the gardencentres' Autumn sales of dry bulbs. I have a fondness for the old forms like this one, raised from wild collected seed, which has a strong demarcation between the maroon and yellow zones, the gardencentre forms seem to have lost this dramatic colour change and instead have a more brown and yellow checkered look. 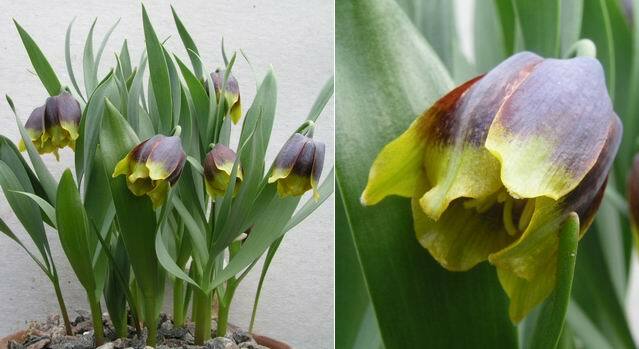 Frit michailovskyii dwarf form x2. 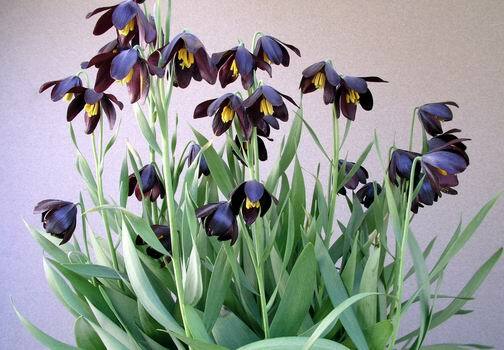 This is another version that we have grown for many years we call it the dwarf form and it is always shorter and smaller flowered than other forms I have seen. Another feature that distinguishes it is the inner three tepals stay connected as the outer three spread outwards, they separate after a day or two. like the way the petals reflex in some clones, giving a pagoda look to the flowers. As well as being a stunningly good looking plant Frit obliqua boasts a lovely scent which sets it apart from most of the genera, which are what I politely call smelly. 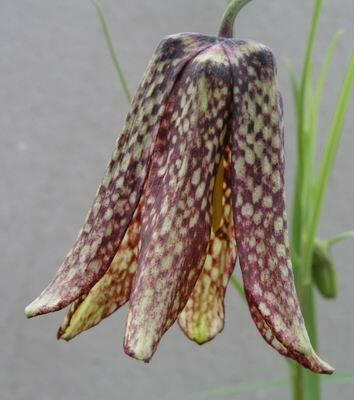 The last frit for this week has one of the most elegant of flower shapes Frit usuriensis comes from China. It is still quite rare in cultivation but I hope that this will soon change as it not only produces rice grains but we have had seed from it for four years now so have a good stock coming along. 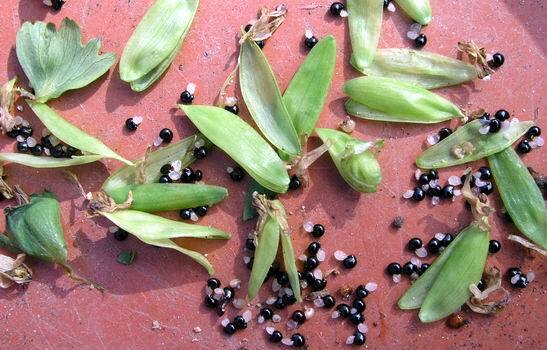 Talking of seed I collected the first seed for the year from Corydalis tauricola today. 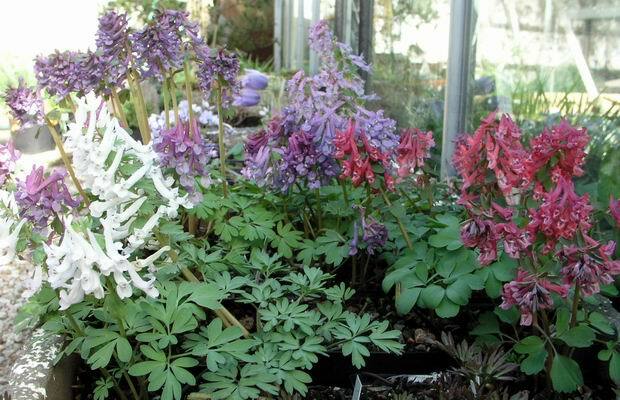 I always sow corydalis seed immediately it is shed as it does not store well. I also sow it deeply that is at least half way down the pot. A nice range of seedlings from the Penza range of Corydalis. We got the first bulbs from Janis Ruksans some years ago and are building up a wide range of forms from this very variable corydalis, they are also self seeding in the garden beds giving a very pleasing effect. Finally this week I have another charge to look out for in the 'Gothenberg Annexe'. A black bird has decided to nest under the bench. 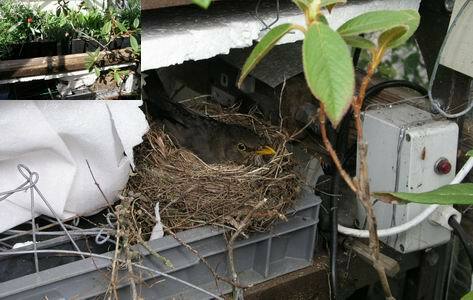 Her nest is at the bottom right of the wee inset picture, she laid one egg on the 4th and another one on the 5th, I will keep you posted with her progress. Luckily she, like most of the birds in our garden has become used to us always being around, and is quite tame.